At Peachey, we live and breathe premium hardwood flooring and understand that the business we love has a language all its own. To help you learn more about what we do, we’ve created this simplified guide to introduce you to some of the terms and processes, from the appearance you create for your hardwood flooring through its construction. Creating the perfect flooring for your home or business is a combination of your personal taste, style, and the choices you make. Understanding the language is a great way to start the conversation with us so we can help you achieve the look that fits your decor and your life. At Peachey®, our flooring is crafted from the finest Appalachian old-growth hardwoods of Ash, American Cherry, Birch, Hickory, Northern Hard Maple, Red Oak, White Oak and Northern Black Walnut. We also create flooring from Reclaimed lumber sourced from antique barns and buildings that have stood the test of time. Whether you choose to have your hand-crafted hardwood from a specific species or reclaimed lumber as your hardwood flooring, you’ll find that each offers its own unique characteristics, colors, and grain patterns. To find out more, please visit our Species page. Grading refers more to the look of the hardwood and is defined by the National Wood Flooring Association. The most rustic grade of flooring available, heavy character flooring includes all character marks such as sound knots, mineral streaks, and other naturally-occurring characteristics. Any material with character marks that could cause structural issues will not be used for flooring. Flooring that features natural character includes most character marks, including sound knots, mineral streaks, and other natural characteristics. Any material with character marks that could cause structural issues will not be used for flooring. For flooring generally free of natural character marks, Peachey carefully selects the highest-grade, premium Appalachian hardwood lumber carefully selected by hand to create the flooring that carries our name. At Peachey, our craftsman can create the perfect flooring for your home or business in a variety of treatments, including Hand Scraped, Black Bleed, Skip Planed, Wire Brushed and Hand Distressed. To find out more, please visit our Treatments page. Peachey Unfinished Hardwood flooring is milled square on the sides and ends without a micro-bevel, unless specified differently. The flooring must then be sanded by a professional installer, filled and cleaned prior to finishing. This method creates more dust throughout your home —​ however, it is the right choice for certain custom finishes, such as tung oil or other unique finishes that can only be applied in the field due to longer drying times. Peachey Prefinished Hardwood flooring is milled with a small micro-bevel on the sides and ends to allow for slight variations in the subfloor, unless specified differently. Our prefinished flooring is stained, if desired, and then finished with two coats of an extremely durable conversion varnish that creates a 3 mil protective layer across the entire floor, which is more than double the typical finish thickness. This uniform finish cannot be applied in the field and must be applied in a controlled environment at our factory. Sheen measures the gloss or shine of your hardwood floor and is measured in a range from 0 (flat) to 100 (full gloss) – the higher the gloss, the more light will be reflected. Matte finish flooring has a 10 sheen, which is very little sheen with a look that appears dull but clean. Satin finish is our standard sheen, which is 20 sheen. Other sheen levels are available upon request for an additional charge. Conversion varnish is extremely durable and very resistant to wear and scratches. The finish creates a luxurious low sheen satin look and requires normal cleaning to maintain the original luster. Repairs can be a little more difficult than other finishes, but are still within reach of homeowners. Conversion varnish is our standard finish used for prefinished flooring. Bona Naturale is a waterborne flooring finish that preserves the true nature of the wooden floor while providing durable protection. The finish is VOC-compliant and environmentally sound. The low sheen helps to make touch-up on repairs easy. For more information, visit the Bona website. Rubio Monocoat oil is a zero VOC (volatile organic compound) finish made from natural products that coats in a single pass. Its unique molecular bonding properties allow for colors and layering effects not available with other finishing processes, while its durable finish makes it easier to maintain and repair without professional assistance. To learn more, visit the Rubio Monocoat website. While choosing the species of your flooring may be the first step in creating a look that becomes uniquely yours, another consideration that will affect the final appearance and performance of your flooring is the cut. All domestic species are typically Plain Sawn. White and Red Oak are available in variety of cuts — including Plain Sawn, Rift and Quarter Sawn, and Live Sawn. Each cut adds its own distinct look and character to the final product. Also known as Flat Sawn, this common cutting technique is used for most hardwood lumber products. It produces an end grain with growth rings of 0 to 35 degrees to the surface for a cathedral style grain pattern. Plain Sawn flooring typically has the greatest amount of lateral movement across the width of the boards during seasonal changes. Most pronounced in White Oak flooring, Quarter Sawn boards have an end grain with growth rings of 60 to 90 degrees to the surface where the medullary rays of the lumber are split during the cutting process, creating a unique fleck pattern in each board. Along with Rift Sawn cuts, this typically provides the most dimensionally stable flooring with little change in thickness or width during periods of low humidity. Produced from the outer wedge of the quarter sawn cutting process, Rift Sawn boards have an end grain with growth rings of 45 degrees to the surface, producing a very linear grain pattern. This technique is best on narrower boards under 5” in width. Like Quarter Sawn above, Rift Sawn flooring is typically dimensionally stable with little change in thickness or width during periods of low humidity. Live Sawn or thru cut lumber combines all three cutting techniques and has an end grain with growth rings of 0 to 90 degrees to the surface. 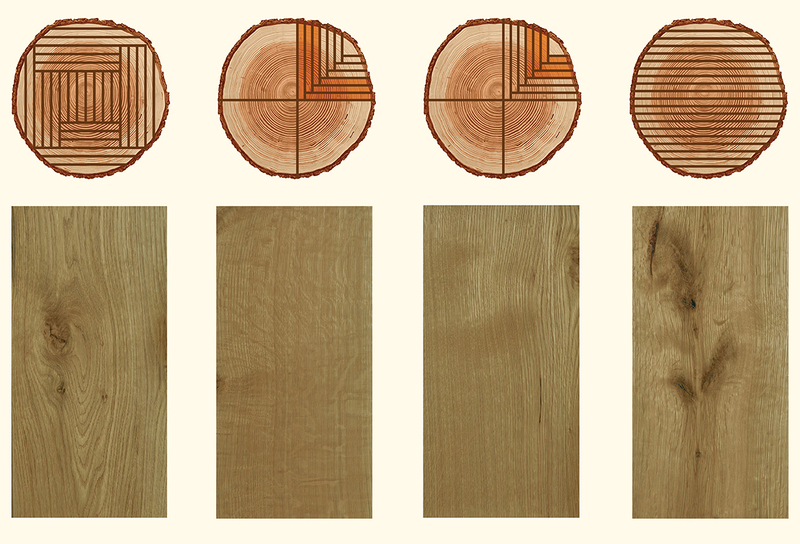 This cutting technique produces a uniquely beautiful look that contains cathedral, fleck and linear grain patterns that are most apparent on boards 6 to 12 inches in width. Live Sawn flooring offers the performance characteristics of all three cuts, making it more stable during seasonal changes, with less shrinking on average compared to Plain Sawn due to the greater amount of Rift and Quarter Sawn material in the cut. When it’s time to build your floor, there are a few factors and terms you’ll want to know. Some will affect the final look of your flooring like width and thickness, while other terms will help you better understand the language of hardwood flooring — including​ how it’s priced, packaged and crafted. Width is measured across the surface face of a board. When selecting the width of boards for your flooring, you can choose a random mix, or go for a more uniform look with boards of equal widths. Today, wider widths have become more popular than narrow strip flooring. At Peachey®, our most popular mixed width combinations are 3″ – 5″ and 6″ – 8″ planks. Our standard thickness is 3/4″, however, 1/2″ and 5/8″ are also available. Typically, these thicknesses are used during remodeling to avoid cutting interior door bottoms or altering kitchen cabinet toe kicks. Flooring length is typically measured by the linear foot, which is a useful measurement for ordering material when length is the only concern. • Specific lengths specifications are available upon request for an additional charge — ex: 2′ – 10′, 3′ – 10′, etc. The area that the flooring will cover is sold by the square foot. When we package our flooring, we typically bundle it into 20 – 30 square foot bundles, each weighing 40 – 75lbs depending on the wood species and construction. Hardwood flooring can be produced as solid or engineered and both are designed for lasting beauty and durability. Each board has a tongue and groove edge locking method. At Peachey, our boards are milled with exceptionally tight tolerances for greater stability and a guaranteed fit for labor savings of 20% on average during installation. Our solid hardwood flooring is 100% hardwood milled from premium Appalachian lumber and can be provided in a variety of domestic species. Solid hardwood flooring is used for above grade level and is susceptible to natural shrinking and expanding as it reacts to seasonal moisture and temperature changes. We offer engineered hardwood flooring in a variety of domestic species. Peachey engineered flooring is constructed with Premium Baltic Birch plywood with an exterior waterproof glue to ensure maximum structural stability in high moisture or high heat conditions. Our engineered hardwood flooring can be refinished the same number of times as our solid wood flooring without any damaging effects. Engineered hardwood flooring is typically used for at- or below- grade-level installations, over radiant heat, and on concrete to provide greater stability in extreme conditions. We also recommend engineered flooring for wide widths over 7″ for improved structural stability. The edge runs along the sides of each board and adds to the overall appearance once the flooring is installed, except in the case of squared edge. Depending on the edge options you choose, grooves between the boards will be more or less apparent. For flooring that provides a high-contrast dramatic effect, chose a bold edge that emphasizes the definition of the board. Smaller bevels typically attract and hold less dirt than larger ones. Squared edges are squared at a 90 degree angle to where edge and end meet, so the boards flush together on all sides, providing a low contrast effect for a sleek and seamless look. Because squared edge must be sanded on-site to eliminate variations, we only offer them unfinished. Micro-beveled is the most commonly used edge and, unless specified differently, is our standard bevel. It is a very small bevel that defines each board and creates a versatile edge that goes well with any style or décor. An edge that is clearly defined with a slightly larger bevel than the micro-beveled edge is known as a standard bevel. This edge provides a time-worn, authentic appearance. This edge is our largest beveled edge and is typically used when matching existing flooring. A pillowed edge is a rounded micro-bevel that offers a softer definition to the sides of the board.